World production of tea could well reach 6 billion kg in 2018. A review of published data of the International Tea Committee (ITC) shows 2017 achieving 5.8 billion against 5.5 the year before. These numbers are driven to a great extent by China’s annual growth of 200 million kg achieved each year since 2014. 10 years ago ITC showed world production of 3.9 billion kg and since then growth of 54% would have been achieved to reach the 6 billion mark for the first time in the history of the global tea trade. Production of Green Tea reached 1.77 billion kg in 2017 an increase of 26% on the 2014 quantity of 1.41 billion kg. Total tea production figures however, rose 12% from 5.21 billion kg in 2014 to 5.81 billion kg in 2017. Here again it is China who drives the numbers with 68% or 1.77 billion of its total tea production of 2.6 billion produced in 2017, being Green Tea. ITC states that in 2017 35% of all tea produced was green and we believe that it could reach 2 billion kg by 2018. Black and other tea (other than Green Tea) was declared at 3.54 billion kg in 2014 and reached 3.79 by 2017. With the Africans led by Kenya having a good cropping year in 2018, production in this category could reach 4 billion kg in 2018. A review of the main Producer Exporter Countries shows Asian tea producers continuing to lead the way on the back of China’s gains. China’s production has risen from 2 billion in 2014 to 2.6 billion in 2017 and on the basis of statistical projection could reach 2.8 billion in 2018. India, the second largest tea producer has grown during the same four year period from 1.21 billion to 1.32 billion in 2017 and is likely to slip below this number in 2018. This is largely due to production losses during H1 and revised policy of restricting plucking during winter in the North. Both these producers consume the greater proportion of their production and therefore approach the export trade as a secondary option with targeted teas. Kenya reached 400 million for the first time in 2013 with a figure 432 million kg and peaked at 473 in 2016 but was down to 439 in 2017 as the country is vulnerable to climate change. Given the more settled weather conditions in 2018 Kenya is heading for a record crop in excess of 480 million kg in 2018. Smaller African producers have also had a better cropping year in 2018. Another poor year of tea production is Sri Lanka’s story for 2018. 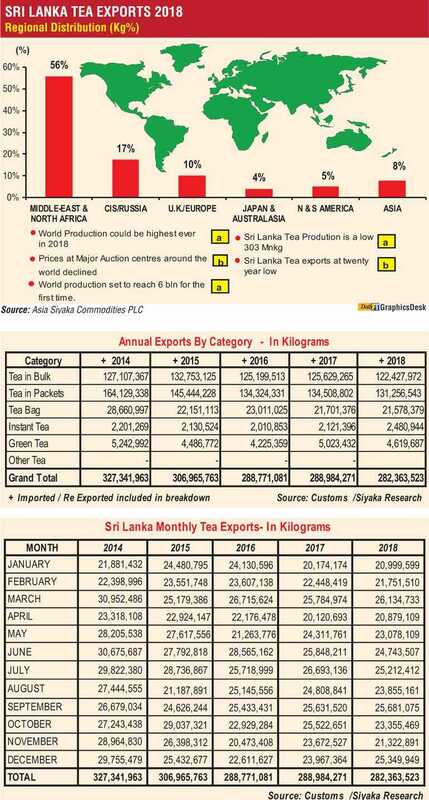 The Sri Lanka Tea Board figure of 303 is below the previous year’s quantity of 307 million kg. In 2016 following the El-Nino drought, tea production slumped to 292 million kg. It must be noted however that Sri Lanka tea production was in the range of 328 to 340 million kg during the period 2010 to 2015. In 2018 a combination of man-made and natural forces limited tea production. At a national level ad hoc policy changes on use of agro chemicals, work stoppage due to factors other than wage negotiations; combined with excessive rain in some months to limit production in the year. A study of the key growing regions, contrasting production in 2013 when the country recorded a figure of 340 million kg against 2018 figure of 303 million kg leaves much for concern. Records show that almost all agro-climatic sub districts are significantly lower. In the Low country Deniyaya, Matara and Galle sub districts have recorded the greatest loss of production over the period. The High Grown regions Nuwara Eliya, Nanu Oya/Lindula Talawakelle, Bagawantalawa, Patana/Kotagala and Agarapathana sub districts have shown greater losses. In the Mid country, Pussellawa/Hewaheta, Kandy/Matale/Kurunegala have recorded losses whilst Gampola/Nawalapitiya/Dolosbage regions have reported sharp gains. Working on the assumption that weather conditions will be more settled during the period, we expect higher tea production in 2019. Temporary resolution of the agro chemical issue and lower fertiliser prices will ensure critical inputs and maintenance of lands at a much better level than the year before. Given the political sensitivity of fertiliser availability in an election year, we expect small holders and Regional Plantation Companies to have access to fertiliser at competitive pricing. The higher cost of labour after the wage increase could be partially compensated if the improved tea crop becomes available. 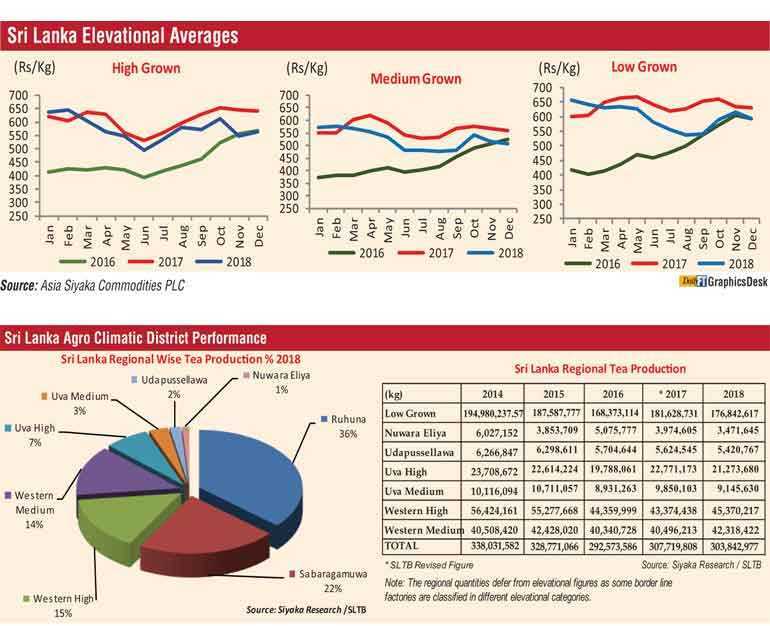 Based on the above assumption Sri Lanka could achieve production of 320 million kg in 2019.Low Growns could rise to around 196 million kg compared with 192 million kg in 2018. High Grown production could exceed 74 million kg against 2018 low total of 64 million kg if there is no disruption to work on the estates. Mediums can reach 50 million kg YoY 2018 figure of 47 million kg. Sri Lanka’s projected national total for 2019 therefore will be 320 million kg. 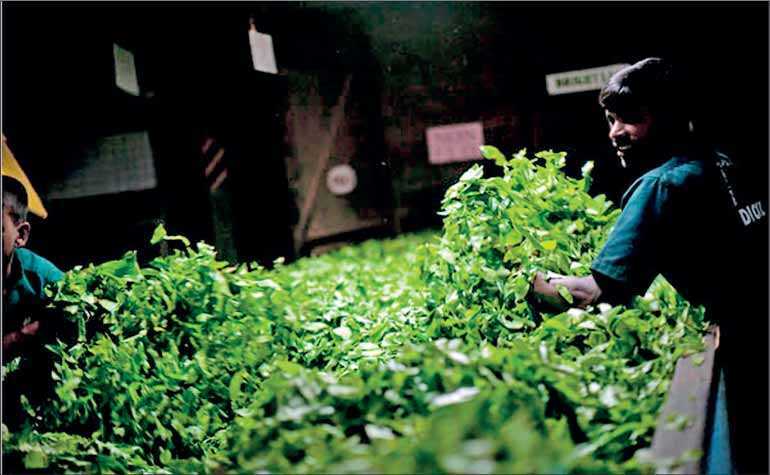 Shortage of workers is not just a problem for the tea industry, but is a serious issue for most agricultural activity and even the labour intensive construction sector. Mid-sized and larger privately held tea plots are struggling to find workers to harvest available crop and maintain basic agricultural work on tea lands. RPCs are compelled to reduce plucking area to cope with the depleted work force resulting from migration of workers seeking urban employment. There is no obvious local solution and the country lacks a national policy on bringing in contract workers from overseas. Whilst we see it happening in an ad-hoc manner in the construction sector it will be a more challenging social issue in the plantation sector. Mechanical harvesting is an option but relying on gradual implementation and market forces may be too slow a process. The tea industry needs a strategic plan. On the face of it we were expecting a year of high crops in 2019 from most major producer tea exporting countries. The increasing conviction of El-Nino predictions however undermine this possibility, particularly for producers from Asia with tea growing regions in the Northern hemisphere looking more vulnerable during first half of 2019. It is not clear if tea growing areas in North India and China two major producer exporters might experience adverse weather conditions. Kenya could have a second year of heavy crops and Sri Lanka is likely to experience a better year of production following three years of low crop. Over all availability of tea will rise in Q2 unless there is disruption due to adverse weather. There are some reports that suggest a possible impact on the monsoon rains and others go on to consider changes to weather in South America. A review of quantities exported by tea producing countries as published by ITC reveals a peak quantity of 1.857 billion in 2013 amounting to 37% of total global production recorded as 5,001 billion. Since then quantities exported by producers has declined steadily to 1.791 billion kg in 2017 which is 30% of that year’s production of 5.8. Of these exports Green Tea was 348 million 19% of total exports of 1.857 billion in 2013. The Green tea share has increased 21% to 387 million of total exports in 2017. Based on this trend we could only conclude that share of Green Tea traded globally would remain similar in 2018. Rising domestic consumption in major producer exporter countries remains a key element and continues to play its part in the years ahead. Sharp production gains of Black Tea in 2018 particularly from African countries is unlikely to be matched by the increasing appetite for tea seen in Asian producer countries. This is likely to impact prices for other black tea exporters such as India, Vietnam, and Indonesia and to a lesser extent, Sri Lanka who is largely a producer of Orthodox Black Tea unique in many respects in style and taste. The other producer countries’ primary product is CTC with a greater volume traded in the “Tea for price category”. Quantities shipped at 282.3 million kg are the lowest since the year 2000. In the two previous years the country shipped 288 million kg. The highest export in a calendar year was 327 million kg in 2014. The country earned Rs. 231.7 billion in 2018 compared with Rs. 233.3 the year before. This converts to an approximate USD value of 1.425 billion compared with 1.530 billion earned in 2017. The highest dollar figure was 1.638 billion earned in 2014 when a quantity of 327 Million was exported. The average FOB value per kilogram of tea exporter declined to $ 5.05 from a highest ever $ 5.30 last year. Both Bulk and Packet tea quantities were lower YoY 2017 but shipments in Tea Bag form remained steady at 21.5 million kg amounting to 8% of the total. A review of destinations shows Russia/ CIS on top with imports of 48.4 million kg down from 53 in 2017. In 2014 Sri Lanka shipped 67.9 million kg to this cluster. Iraq 38.4 million kg (35) is second. Shipments to and through Turkey were 35.6 million kg (37.8), Iran 23.9 million kg (27.4 -13%) this high value market is critical to the Low Grown sector. Libya 13.6 million kg (11.6), the UAE 11 million kg (15.7). Syria 10.1 million kg (7.3) is the second consecutive year of recovery. China 10 million kg against (9.9), imported 5.3 million kg in 2014 and grew 89% during the period. Chile follows at 7.5 million kg (7) and Japan 7.4 million kg (7.7) make up the prime destinations. The higher volume of Black Tea production and exports particularly from Africa had prices decline at the Mombasa Auction in Kenya and Indian Auction centres. Prices realised for Indonesian and Vietnamese exports declined in sympathy. In Sri Lanka the market for Orthodox teas remained relatively strong due to shorter supply and were less impacted by value loss at the other auction centres. The country had its own set of problems however, that brought its prices down in Rupee and US Dollar terms despite continual depreciation of the national currency. Continuing sanctions on Russia and Iran restricted trade with their markets with negative consequences at the Colombo Tea Auctions. Technical issues with shipments to Japan compounded the issue. The positive aspects for Ceylon Tea prices at the Colombo Tea Auction are primarily centred on the depreciated Rupee converting to a higher level of auction price in the Medium term. Given that depreciation of the SLR has not taken place in isolation as key importers Russia, Iran and Turkish currencies too have depreciated. Despite rising crude oil prices these currencies have not strengthened due to other complexities. We expect a better market for Western High Growns in particular during Q1 Dimbulla season with many of the Japan related issues being resolved. We expect further increase of tea shipments to China, Hong Kong and Taiwan. For the Low Grown teas we see a recovery with gains from growing demand for Syria after continual gains over the last two years. Re-payment of Iran oil debt with supplies of tea remains a positive prospect if permitted by International powers.